The canal towpaths of east London are an important resource and are becoming increasingly popular with walkers, fishermen, cyclists, joggers and boaters. In some places, and at peak times, this can lead to congestion. 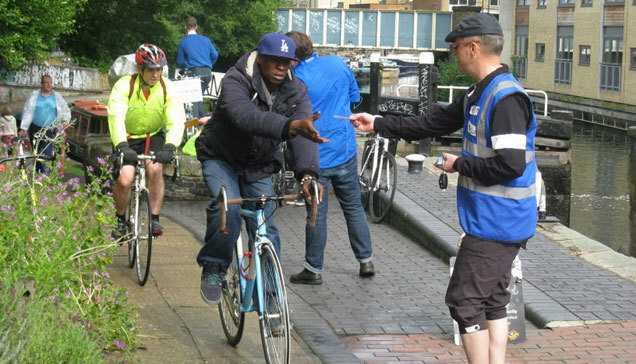 To help manage growing demand the Canal and River Trust (formerly British Waterways) are working to improve the streets surrounding the canal for cyclists and pedestrians. The Canal & River Trust and Tower Hamlets Wheelers (the local London Cycling Campaign group who provided the Dr Bike at today's Dog Show and Community Fair) are inviting local people and community groups to contribute to finding solutions. Local knowledge is invaluable in doing this. The aim of the workshop is to explore different ways in which residential roads can be made more attractive for pedestrians, cyclists and local communities.